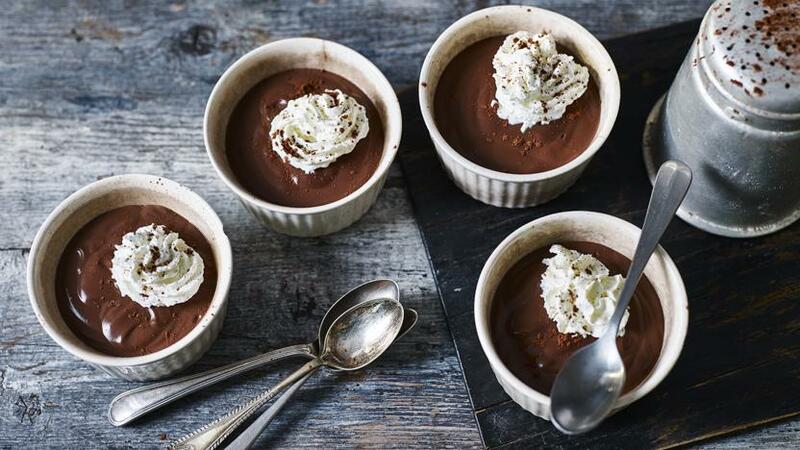 Shop-bought, low-fat custard forms the base of these easy chocolate dessert pots, flavoured with coffee, orange and cardamom. Each serving provides 155 kcal, 5g protein, 25g carbohydrates (of which 20g sugars), 4.5g fat (of which 3g saturates), 0g fibre and 0.1g salt. Heat the custard in a saucepan over a medium heat. Add the chocolate, espresso, orange zest and cardamom, stirring continuously until the chocolate has melted. Sieve into a jug. Divide equally between four 125ml/4½oz pots or serving bowls and refrigerate to firm up for at least 3 hours (it won’t set completely firm). When ready to serve, top with light squirty cream and a dusting of cocoa powder.